With Mardi Gras approaching, it’s time for some Cajun comfort food. It’s time for some Red Beans and Rice Stuffed Peppers! Line’s good, sweep for weight only! Sweep! Sweeeeep! 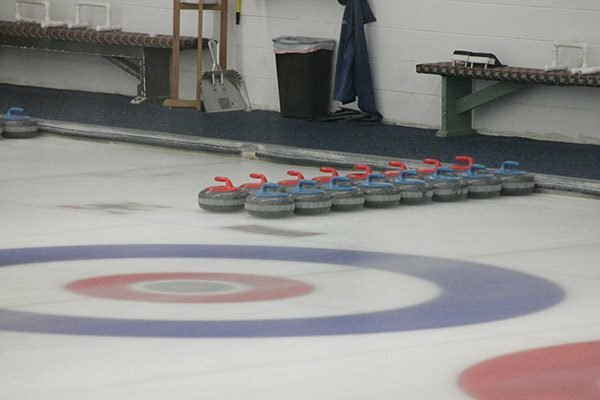 If these words sound even vaguely familiar to you, then chances are you’ve curled before. Laura and I discovered curling when we wandered into the Schenectady Curling Club during the 2014 Sochi Olympics. The club was holding an open house, and we decided to see what curling was all about. In truth, I just wanted to tell my friends back in the South that I’d gone curling. Turns out we got hooked on the sport, and we’ve been avid curlers ever since. As the PyeongChang 2018 games are set to begin next week, I figured a post about curling would be appropriate. It does look like an interesting sport, right? 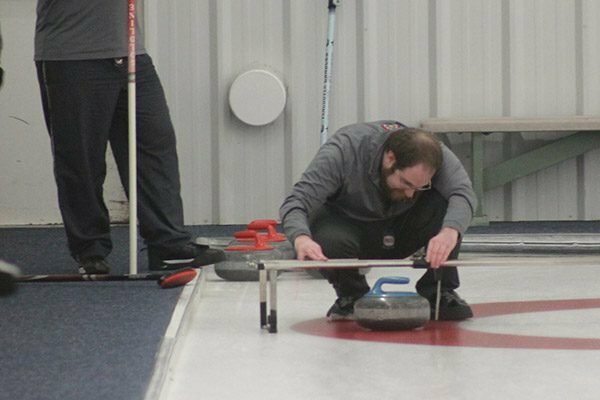 Prior to that open house a few years ago, my only exposure to curling had been on tv during the winter Olympics. I remember watching curling as a kid. And I remember not having a clue what the sport was about. Does this sound familiar? Then let me hopefully shed some light on curling. Curling is a sport played on a sheet of ice where two teams take turns sliding stones into a set of concentric circles. Think shuffleboard on ice. But let me break that down a bit more. Each team has 4 members. There’s the skip who stands in the middle of the far circles and calls the shot while one of the other teammates “throws” (i.e. slides) a granite rock down the sheet of ice. The stone weighs about 44 pounds, but you never actually pick the stone up from the ice. The goal is to slide out and push the stone down the ice so that it lands in the center of the circles. Sounds easy enough, right? Yes and no. 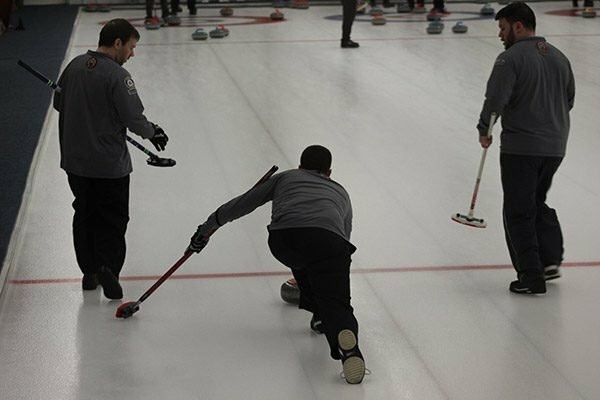 Curling is a relatively easy sport to get the hang of, but it’s an incredibly difficult sport to master. The stone naturally curls (thus the name!) as it slows down, so the skip’s job is to judge how far outside the shot should be aimed in order to have the stone land where he or she wants. The other two teammates follow the stone down the ice and sweep as needed. Their job is to judge the weight to determine if the stone needs sweeping in order to reach the target position. Sweeping actually melts the very top molecules of ice, thus reducing friction and helping the stone travel a bit further. The final score often comes down to just inches, so sweeping is very important. But remember that whole thing about the stone curling as it slows down? Sweeping prevents the stone from slowing, so therefore sweeping impacts how much the stone curls. Have I thoroughly confused you yet? One of the questions I always get about curling is “Isn’t the ice slippery?” Well, it is…sorta. I mean, it’s ice. You do have to be careful. But the ice is slightly rough, so it’s not as slippery as you might think. With that said, every curler has fallen at some point during a game. It happens. It’s usually more embarrassing than painful, though. I could go into a lot more depth here, but I’m sure I would just bore your socks off. Have I convinced you to at least watch curling at some point during these Olympics? The pros are incredibly talented, and it’s fun as heck to watch their games. Needless to say, club levels players like me miss far more shots. The real game is having a plan B (or maybe a plan E) in place so you know what to do if (and when) a shot is missed. In fact, the skip on my team will often call out the primary shot, but point out a desired backup shot if things go awry. And at the club level, things go awry. It happens. 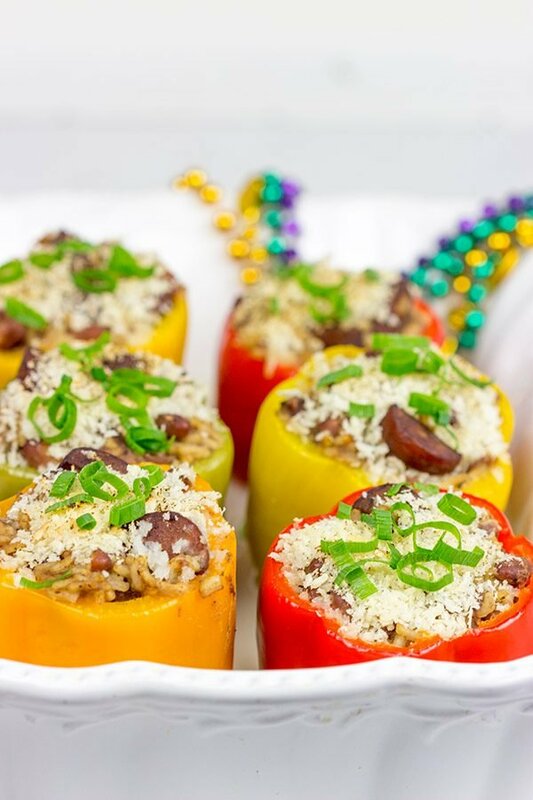 As this is a food blog, and I just spent the last several minutes rambling about something non-food related, I figured we should wrap up with a chat about these Red Beans and Rice Stuffed Peppers. 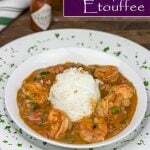 After all, Mardi Gras is sneaking up on us soon, and that means some good Cajun food is in order. That means these Red Beans and Rice Stuffed Peppers are in order! Nearly all Cajun recipes start with the “holy trinity of Cajun cooking,” or bell peppers, onions and celery. I’ve been making Red Beans and Rice ever since I lived in Louisiana for several years after college, and red beans are one of my favorite Cajun meals. There’s just so much flavor locked in there! But the other day, I had a fun idea of combining my Red Beans and Rice recipe with my Italian Stuffed Peppers recipe. Since the filling for these Red Beans and Rice Stuffed Peppers was going inside of a bell pepper, I decided to leave the peppers out of the holy trinity. Other than that, it’s pretty much the same classic recipe. Mix it all up, let it simmer away for several hours and then stuff those peppers! 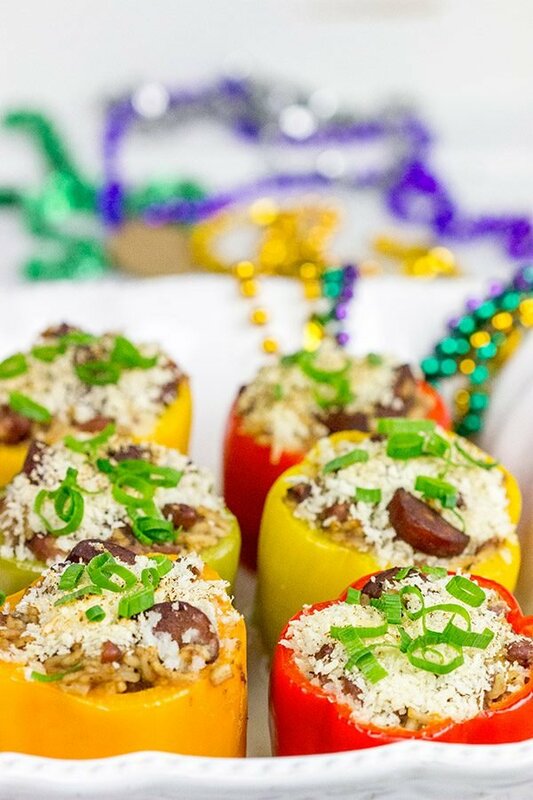 If you’re looking for delicious comfort food that’s perfect for the Mardi Gras season, then these Red Beans and Rice Stuffed Peppers are the answer! It’s an inexpensive meal (especially if you use only green bell peppers) that feeds a crowd. Enjoy, my friends! Also, I just had to add this video. Cheetos came up with this “How to Curl” video featuring Vernon Davis and Ladainian Tomlinson. It’s hilarious! I also love that curling is getting a little bit of “mainstream” love, too! Using a large stockpot or Dutch oven, add olive oil and place over medium heat. Once hot, add the diced onion and celery. Cook, stirring occasionally, for 5-6 minutes or until onions begin to soften. Add the Cajun seasoning, salt, parsley, garlic and andouille sausage; continue cooking, stirring occasionally, for 5-6 more minutes. Add cooked rice to the pot with the red beans; stir until well combined. Spoon red beans and rice filling into each of the peppers. Sprinkle bread crumbs evenly over tops of peppers. Pour ¼ cup of water into bottom of pan. Cover dish tightly with foil and bake for 40-45 minutes, or until peppers are tender. Before serving, garnish with sliced green onions and hot sauce (optional). Stuffed peppers are a favorite around here, too, Deepika! But with Mardi Gras coming up, I decided to put a twist on the classic fillings…and these turned out so well! 🙂 I agree that curling might sound technical, but it’s not that bad. It’s just difficult to shove it all into a short post. Haha! Thanks, my friend! I forgot all about my plans to try curling last fall! Thank you for the reminder that I need to get on it. It really does sound like fun, although klutzy me will probably come away with an injury :). I love stuffed peppers and haven’t made them in forever so I might just have to try these this weekend. Happy Friday! Kelsie!! I made you promise to try curling. Time to put it back on the list! I can almost guarantee that the Phoenix Curling Club will have open houses soon because of the Olympics. You have to go…and then send me photos as proof! 🙂 Also, stuffed peppers are delicious. 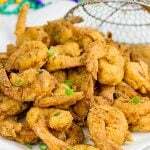 Especially when you put a Cajun twist on ’em. Haha! Hope you had a great weekend, my friend! Ha, you’re right, I’ve seen curling on TV before, watched it for a bit and thought, “I have no idea what’s going on here!” Love how you got hooked on it. Does Laura love it too? Laura loves curling just as much as I do! We curled together the first year, but when we realized that we like curling in the men’s/women’s leagues more. So I curl 1-2 nights a week in men’s leagues, and Laura curls in the women’s leagues. It works out well now that we have a Robbie, too! You guys should go check it out…I promise (promise!!) that you will like it! I think it’s so cool that you and Laura are in to Curling…such a fun, quirky sport! Thanks for the inside scoop on it. 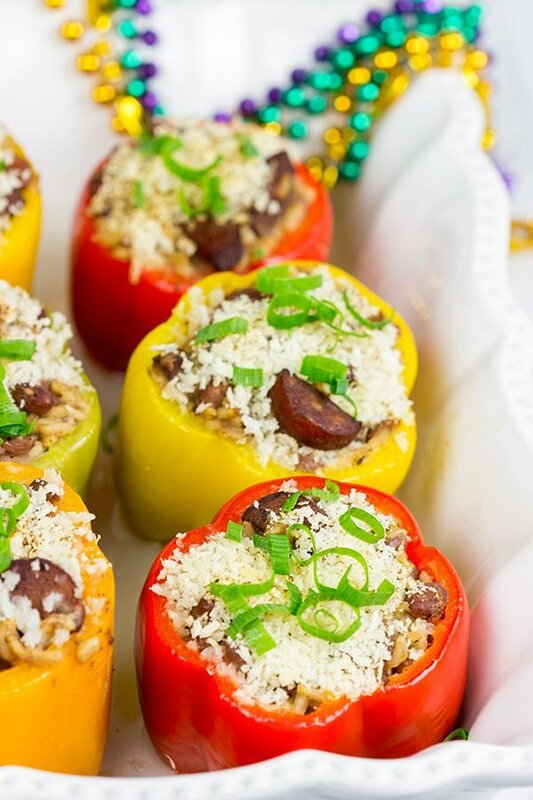 Loving these stuffed peppers – so colorful and perfect for Mardi Gras! Curling really is a fun and quirky sport. We went and tried it out just to say we did it…and here we are 4 years later totally hooked on it. 🙂 Thanks, Marissa! I’ve never played curling, but when I was in college there was an intramural team of broom hockey. You played it on the rink in your tennis shoes with a broom and a puck. I thought it was fun, but quickly realized a lot of the players played for blood – not quite my style. These peppers are my style – full of yummy ingredients and so brightly colored! Yeah, I don’t think you can really curl for blood…it’s not exactly a contact sport. What I like about curling is that involves both physical (sweeping) and mental (lining up shots, calling shots, etc.) It really is an awesome sport! Oh, and these peppers are totally my style, too. 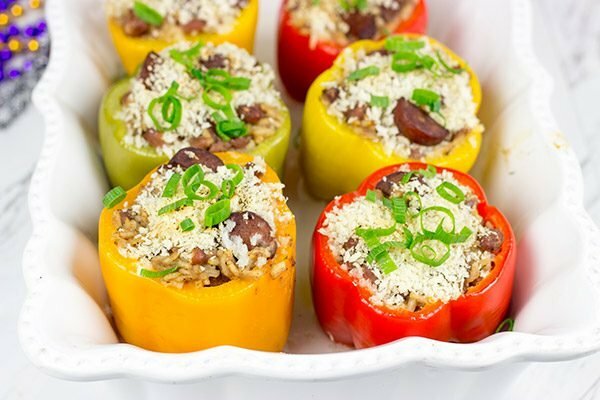 I love stuffed peppers, and the Cajun twist on these is really fun! 🙂 Hope you had a great weekend, Kathy! I work with someone that is on a curling team, he loves it. 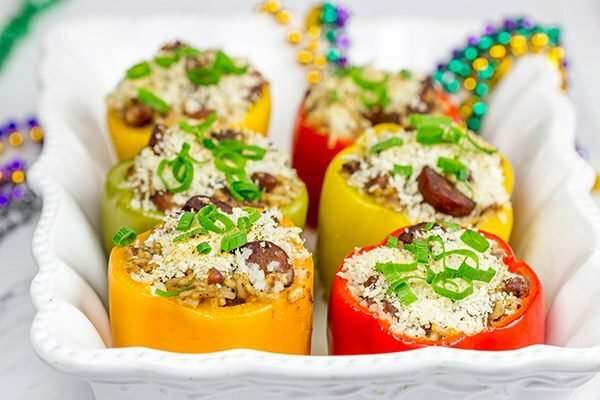 Thes red beans and rice stuffed peppers sound delicious. Sound like they are full of flavor. When I was a kid, my Mom made stuffed peppers and I just ate the inside. Those were the days I thought bell peppers only came in green. But they did grow on me. This recipe looks perfect for Mardi Gras. And I love red beans and rice! Thanks also for the lessons on curling – I’ve watched it many an Olympics, but never quite understood it – so thanks, I feel like I understand what all the sweeping and “throwing” is all about! Curling totally seems like an interesting sport! I like watching it every year. I remember the first time I saw it, I imagined some bored ice-rink janitors decided to come up with a new game. Really good read, I learned a few things about it! Not only that, you end it with some delicious looking stuffed pepper! 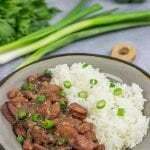 Beans and rice are such a tasty staple with endless possibilities. We’ve been buying up the peppers lately, this looks like a fun way to use em up! So yeah, curling is amazing! We went into that open house partly as a joke, and we came out avid curlers. 🙂 Also, red beans and rice is totally one of my favorite meals…and stuffing it in bell peppers is purely an excuse to make red beans again. (Otherwise I might’ve gotten a cross look from Laura…but instead it’s “Well, it’s for the blog.” Haha!) Thanks, Matt! These peppers sound delicious. I love that used different color peppers. That’s really cool. Also thanks for the curling story. I really liked it. 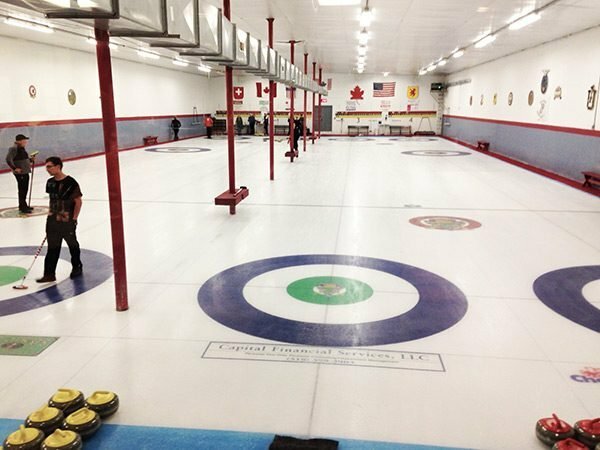 I think I started paying heed to curling after you started talking about it on here – till then I always used to think it was a bunch of guys sweeping up the ice for some piece of metal – and now, thanks to this post, I know there’s so much more science behind it! And – as we all know – any type of sport NEEDS delicious food to fuel up with before AND after and delicious these stuffed peppers sure seem to be! So so loving the andouille in these! Fantastic, my friend! Hoping this week is off to a wonderful start for y’all! Yes! 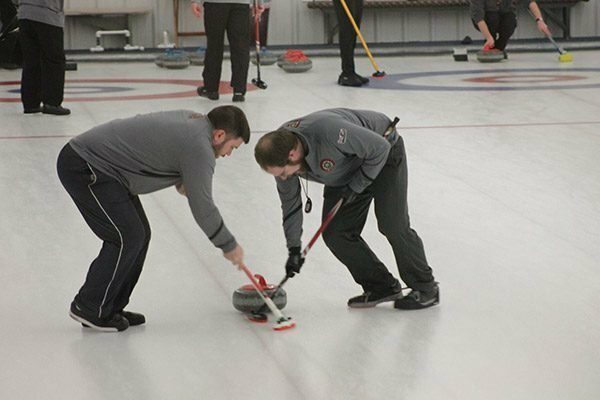 There really is a science and strategy behind curling. I know it looks strange, but the sport is fascinating once you understand the physics behind the stone and how the sweeping works! And I totally agree with you about delicious food…these stuffed peppers are SO delicious, Shashi. In fact, I think I need to make another batch soon. 🙂 Thanks so much, my GA friend!